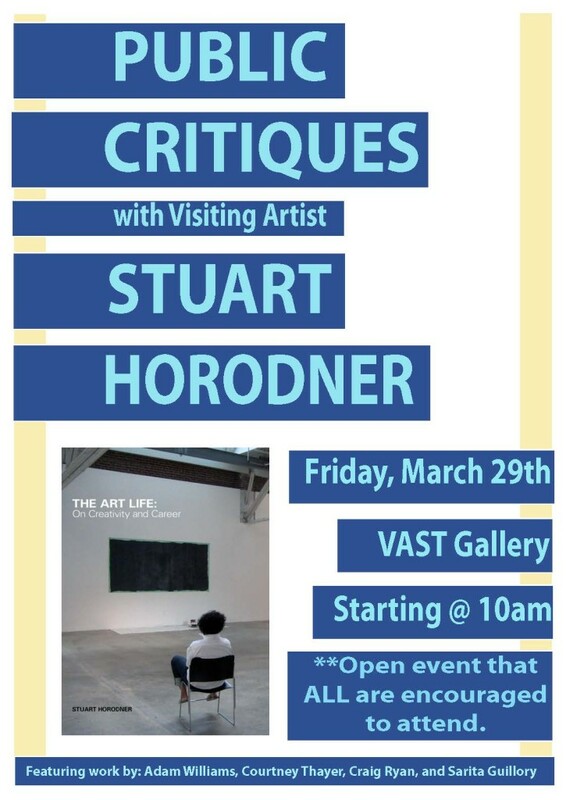 As part of FSU Art’s visiting artist lecture series, visiting artist Stuart Horodner will be giving a lecture on his recent book, The Art Life: On Creativity and Career. This lecture will be happening on Thursday, March 28th at 7pm in FAB room 249. In conjunction with his lecture, Stuart Horodner will also be leading a public critique using four of our graduate student’s work. This event is open to the public and will take place at the VAST gallery on Friday March 29th, starting at 10 am. The public critique format is an exciting forum and ALL are highly encourage to attend this event. Please come to support your peers, learn from Horodner’s observations, and contribute to the art conversation and culture we are building at VAST.